Arthur Vanhoutte passes the baton to Akio Kotake and takes up new role as consultant for Mutoh group. 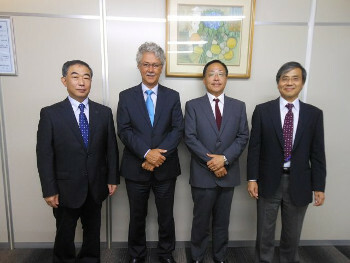 From left to right : Mr. N. Hayakawa – President & representative Director Mutoh Holdings Co. Ltd., Japan, Mr. Arthur Vanhoutte, Consultant Mutoh Group, Mr. A. Kotake – Managing Director Mutoh Belgium nv, Mr. H. Aoki – Managing Director Mutoh Holdings Co. Ltd., JapanMutoh Belgium a subsidiary of Mutoh Holdings Co. Ltd., Japan, has announced the appointment of a new Managing Director, Mr. Akio Kotake. He has taken over the responsibilities of Arthur Vanhoutte, who has been leading Mutoh’s Belgian operation for the past 24 years and who has now been appointed as senior consultant for the Mutoh group. Akio Kotake’s role as the new managing director will be to oversee the sales, sales support, logistics, commercial & product marketing, product support and after-sales service activities for Mutoh wide format printing and sign cutting equipment in the Belgian operation’s sales area. Aged 58, he joined the Mutoh Group in 2011 as General Manager International Management Division at Mutoh Holdings Co. Ltd, Japan. Akio Kotake has been involved in Mutoh’s European business since 2012 as Managing Director of Mutoh Deutschland GmbH. Holding a Bachelor degree in electronics engineering from Sophia University, Tokyo, Japan, Kotake has extensive experience in international business. Before joining Mutoh, he occupied several senior roles in marketing & sales at Victor Company of Japan Ltd (JVC®), both in Japan and Europe. Mr. Nobumasa HAYAKAWA, President and Representative Director of Mutoh Holdings Co. Ltd, commented: “I would like to express my sincere appreciation with deep respect to Mr. Arthur Vanhoutte for his great effort, devotion and achievement for 25 years since the foundation of Mutoh Belgium NV. He will now support the company as independent consultant to ensure the customer satisfaction under the new management. I would also like to welcome Mr. Akio Kotake as new Managing Director and General Manager of Mutoh Belgium, and expect him to contribute to the further growth of our business together with all the customers and the Mutoh Belgium team. Mutoh will continuously introduce competitive products and strengthen the partnership with our customers. We highly appreciate Mr. Vanhoutte’s future support to the new team”. Aged 65, Arthur Vanhoutte has been active in the international graphics sector for more than 43 years, having occupied several senior roles in manufacturing, purchasing, R&D, marketing and sales before his tenure at Mutoh. He joined Mutoh in 1990 and was instrumental in starting Mutoh’s Belgian operation from the start. The Belgian Mutoh division currently makes an annual turnover of €35 million.